In the wake of an economic collapse in the United States and a plague that devastated Europe, the world is a darker place. Crime is rampant in the US, particularly juvenile crime. Cain lives in fear of his abusive father, waiting for the day that the Parental Morality Act is passed. But it doesn’t come fast enough, and he beats his father to death with a pipe. Forced to flee to the streets, Cain is plunged into the underbelly of third-world America. His life is aimless until a priest takes pity on Cain and gives him shelter. When Cain wants to return the favor to a younger boy, he finds himself embroiled with a sixteen-year-old madam of a brothel/drug dealer. Maureen is strong, ruthless, and beautiful. Cain can’t help his attraction to her even as he is repulsed by her business. But when one of Maureen’s johns gets violent, she’s forced to defend herself. The only problem, the dead man is a corrupt cop. 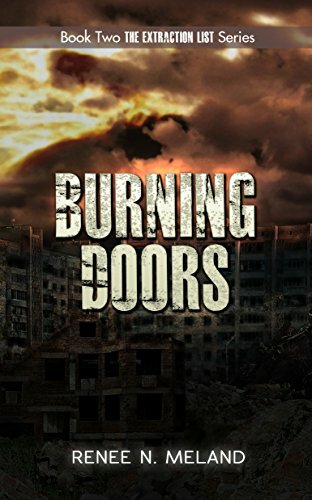 I wasn’t expecting Burning Doors to be a prequel to the Extraction List. It follows the life of Cain and shows how he becomes such a ruthless, yet caring, man. The man who would help a young girl and her mother escape to safety. It’s a tragic tale and while I had hoped for a continuation of the story, I found myself caught up in the story. This is a bleak look at society’s crumble. Burning Doors is available from Amazon.